April Fools Day, I can't think of a better day to attempt a hike to the lava flows. The plan is to hike through the National Park during the day then back at night. I had to see the glowing red flows at night. This plan was carefully calculated based on the first attempt chronicled back on December 6th. 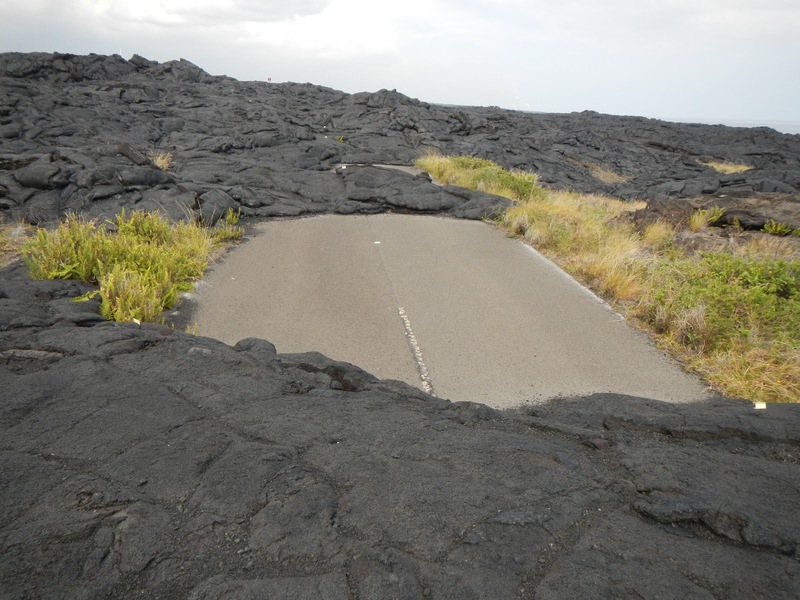 The trip starts off with a three-and-a-half-hour drive from Kailua to the parking lot at the end of the road in Volcanoes National Park. We've been told the hike is 4 to 5 hours one way. The sun will set around 6:30 p.m., so if I get there at about 2:00 I will be in good shape. It's 11:00 a.m., better get going. I stopped off at the ranger station to get an update on conditions. The ranger is very clear. It's not worth the hike. You probably will not see anything. The lava flow has gone underground to the ocean. When it gets to the ocean you can't see anything because of the cliffs and straight coastal edge. Nothing to see here, move along people. He's probably right, a foolish venture, but isn't that what this day is all about? One of the warning signs. I get to the parking lot around 2:30 p.m., wolf down a turkey sandwich, load up the backpack with ten bottles of water, snacks, cameras, phone, and off I go. Now my confidence is waning a little. Is this really worth it? A short hike to the end of the paved road, yet for some strange reason my feet are already hurting. Do I commit? I'm running a little late. What story could I concoct for bailing this time? It's strange to see the old lava flows completely covering the road in places. I'm a half mile from the car and at beacon zero, the last time I will see any kind of level surface. I meet a small group of people coming back from the flow. "Is it worth it?" They all agree that it is. The woman in the group describes the look, "What seems like an innocuous small silvery ooze or bulge, then it would break and the red lava would appear. 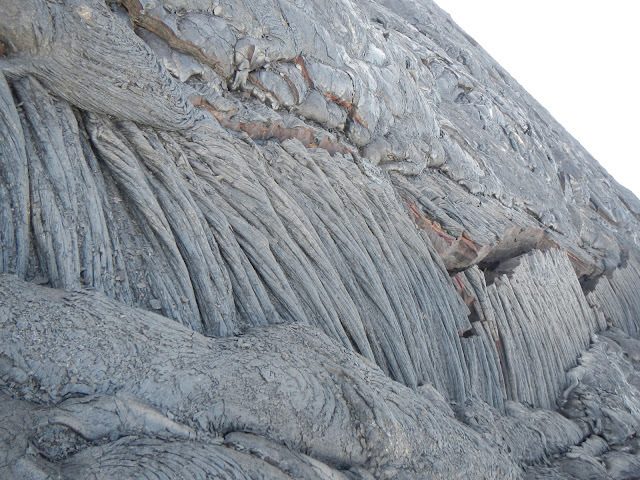 You can tell where the fresh lava flow is by how silvery it is." The guy chimed in, "...and hot, it's really hot!" Onward to beacon 1, 2, 3, 4, 5, 6, and now 7. 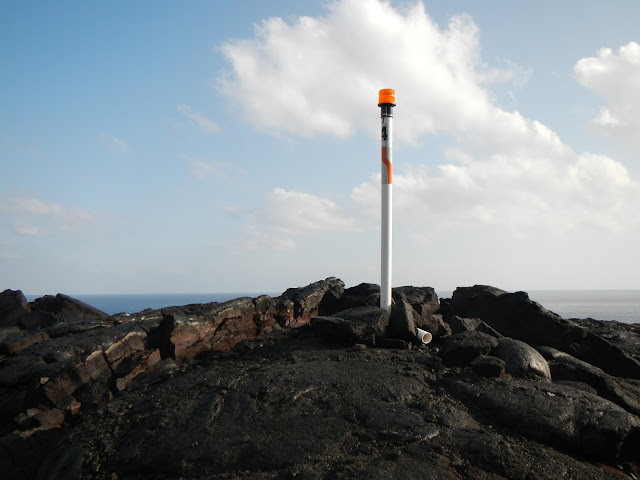 Spaced about a half-a-mile apart, these small markers keep you from drifting too far off course. It's 5:40 p.m., and I guess I'm about halfway. There are no markers pass this point, and I have another 3.5 miles to go. My targeted path is now just a puff of white smoke in the distance. The sun is setting. I take an often needed break, and sit on the rough lava. Interesting lava formations along the way. Looking around, I see a little steam vent a few yards away. I realize I'm in the middle of hundreds of little steam vents. There's even a vent right between my legs. This can't be good. Sitting on wispy steam vents. The sun gone, and the moon has not risen. I turn on one of my flashlights, and head for the orange glow on the coast. My flashlight lets me see little more than the space in front of my feet. Over the next ridge and voila, across the inlet is a mass of steam glowing. 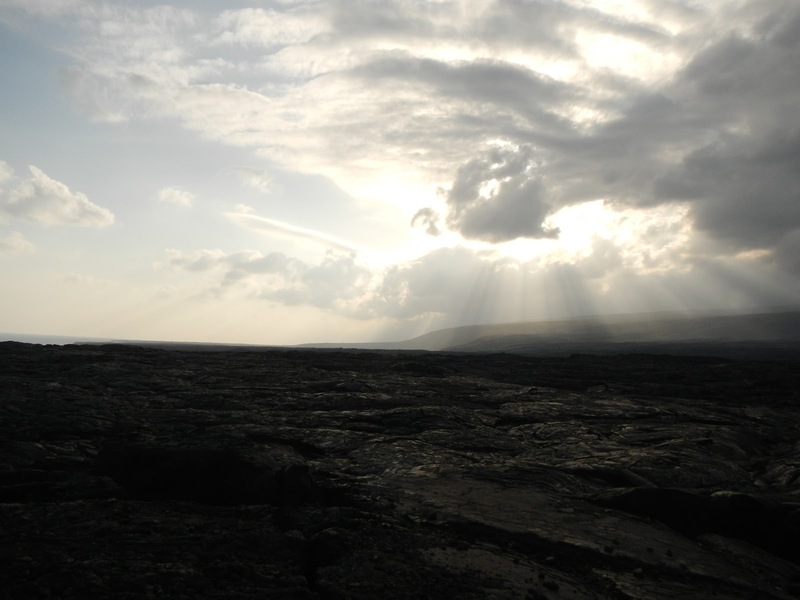 Every once in awhile the steam would clear, and I could see the lava flowing down into the ocean. "Wow, this is amazing. I've got to get a closer look." I cut back inland and move around a large mound and then back to the cliff's edge. I move as close as I dare. The massive rolls of steam are rising up just in front of me. I carefully find a ledge I can sit on, not too close, not exactly sure where the land ends. Video of amazing steam and lava. I can hear the hiss of the steam, the crackle of the lava cooling in the water, and the waves hitting the beach then pulling molten rocks out into the water. 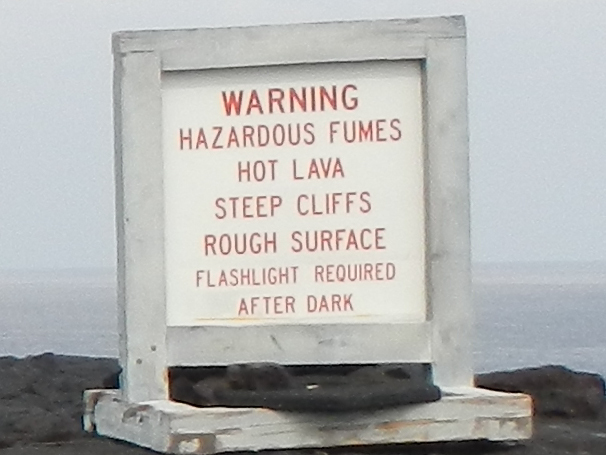 I see the bright orange glow of the lava flow, an occasional splatter of flying lava bits, massive amounts of steam bellowing up against the cliff then blowing out to sea. I watch this surreal event for about an hour and a half. It's 9:00 p.m. and time to head back. I wish I had arrived in daylight. I would like to look around more, but at night it's just a little too difficult. I attempt to retrace my path. The footing becomes a little different, like walking on charcoal, the ground seems firm but gives about an inch with a crunch on every step. This is new. A few yards more and I can feel wafts of steam. That is not new. A couple of yards more and I feel an intense heatwave, like walking up to a massive campfire, but there isn't anything glowing, or red, or orange. The ground looks a little different, more silvery than black. It dawns on me what the woman told me at the beginning of the hike, "Fresh lava is silvery." Well, it's silvery all around me. All I can think is, "This is a little disconcerting." I hear that refrain in my head over and over. I try to determine where the heat is originating and head away from it. At one point, I am straddling a crack, and I looked straight down into it. It is glowing red. "Disconcerting indeed." My first thought when snorkeling with dangerous animals is get the camera and take a picture, yet this situation calls for nothing but an exit, stage left. I cleared the area. With only the barely-discernible shoreline and my faithful Orion to guide me, I headed in the darkness towards the unseen beacons and the path back home. Up a black lava stack and down, repeatedly, I carefully move through valleys and crags. My legs are getting tired, and my biggest concern is tripping and falling on the sharp glass-like lava. Every step is calculated. I wonder when I'll be able to see a beacon. A little further, still no sign of beacon 7. I know my path is not straight, probably zigzagging all over the place, but generally the right direction. Still no beacon in sight. Getting more fatigued, I think, "When I get to beacon 7, I'll only be half way. Disconcerting." Between weary steps, I think, "Someone has either removed the beacons or they are not flashing. A true conspiracy against me is at foot. Why would someone remove the beacons? I will definitely leave a complaint letter with the park rangers!" "I know this is crazy, but I haven't seen a beacon which can be visible at over a mile away, if I'm at the right angle and height." I come around a bend, and I see something white up ahead. I go off my intended course a little to check it out. "Ah ha! I was right. There is a conspiracy against me. 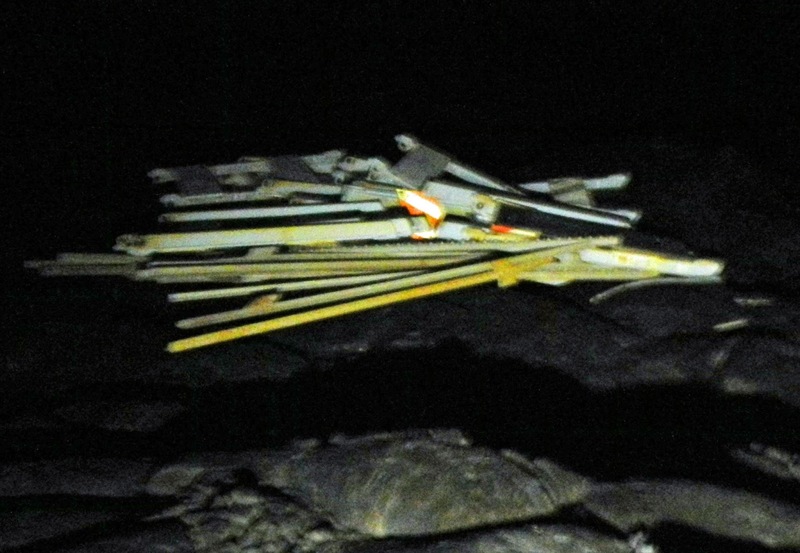 A big pile of beacons and warning signs." I trudge on, and on, and on. "Oh, look, that could be a beacon up ahead. Those little crooks missed one. Or am I a little crazy, and I'm just now getting to beacon 7." I get close enough to see the number, "number 4. Whew, I'm almost back." 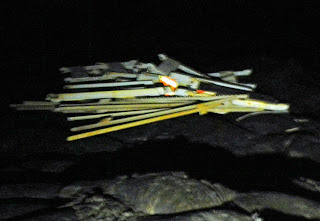 I can see the string of beacons heading back to civilization I look behind me and can see the string of beacons heading out to the lava flow. "How did I miss them?" Well, it was a good conspiracy while it lasted. Marker 3. Marker 2. "Yea, one more marker." Marker 1. "I made it. No, marker 1 isn't the first marker. How could I forget Marker zero. I've miscounted how many water bottles, and how many markers I had left, and it is still another mile to the car." I get back to the car at 5:00 a.m. April 2, exhausted, wishing I'd started earlier, and taken a snack that wasn't sweet, more water, and our best camera. It was a difficult fourteen-and-a-half-hour hike. Just a short three-and-a-half-hour drive to my bed. I now check this off my bucket list, and move along.